My aging mom is looking to start biking to work as a way to stay healthy. But as an aging women she needs certain things so that she feels safe and comfortable riding a bike about 15 minutes each way. It must be somewhat covered to provide protection from the elements. 3 wheels would make her feel a lot more safe. An electric assist would be very helpful. It can't be super expensive. Does there exist a bike that matches these requirements or at least designs to create such a bike? I believe the short answer to your question is no. The first three requirements that you list put you in the 'deeply customized' bicycle neighborhood. This is in direct opposition to your fourth requirement--custom bikes are very expensive. Additionally, without providing information about the climate where you live, local cycling infrastructure (bike paths/lanes/etc. ), or your budget, this question is nearly impossible to answer. Nothing makes me happier than people deciding to be healthier by way of bicycle commuting, so I'd like to offer you some ideas about how to get your mother on a bike! If it isn't possible to ride with her, encourage her to join a local cycling club (if available) and ride with the older group. Once she finds out whether this is something she can commit to (or not), you can start making plans to set her up with a commuting rig! Look at how often it rains during her intended commutes. In the Netherlands, which is known for 'always being rainy' you need your waterproofs about 6 days a year when commuting 5 days per week. A little drizzle should not stop a person from riding when a good coat is used and a hood/hat or helmet with rain cover if a helmet is the norm where you are. A good set of waterproofs which is easy to put on and take off is more useful than a cover that always catches wind and will likely not protect against rain in side winds. Plan the route (as far as possible) such that the quiet roads or bicycle paths are used and busy roads are crossed at traffic lights or other 'easy to use' points. Try out several bikes, rentals or loans for a few days if available. Have her try out bike seats in different heights. While she is still unsure about riding, easy access to the ground is good. But the ride will be easier/smoother when the seat is a bit higher up. So I would suggest a bike that allows both, the lower position and the 'proper' high up one. If she is really not able to ride a two wheeled bike, think about a recumbent trike. Those are available with e-bike tech as well. Not only is the bike stable, also the position of the rider on the bike is stable. I have used a recumbent trike for 5 years, just for the fun of it, and can certainly recommend it. You are lower down (gives more stability) but you are wider and when viewed really seen. I would not go for the extremely low ones, but for one about the same height as a dining chair. Yes, you get wet when it rains, but are you made of sugar? I survived getting rained on all my life and still commute by bike. Unlikely to match all your requirements. 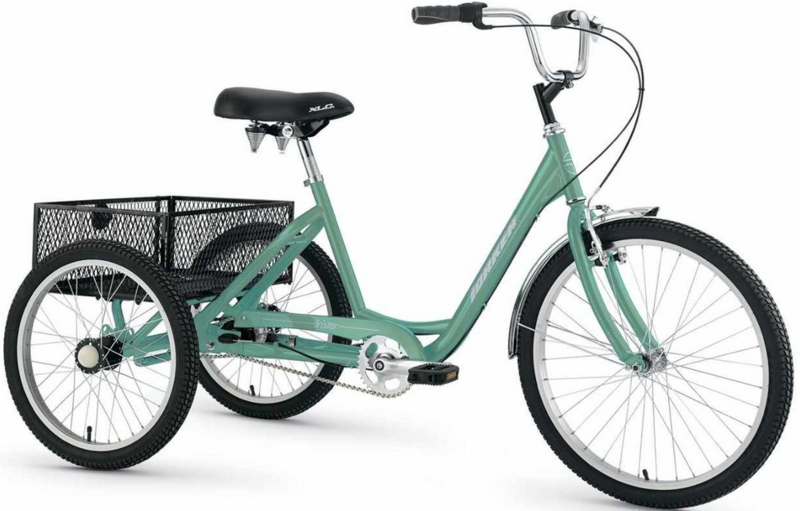 An adult trike offers exercise, and stability. But they're not overly cheap new. Weather protection comes in the form of a helmet and perhaps a rain poncho, and even knee-high gumboots. And electrification of these would be limited to a front-wheel kitset only. On the plus side, you can locate the batteries in the cargo tray. I'm sure you can google for "electric adult trike" and come up with some pricing, but such answers are off topic for SE. Most ebikes are not weatherproof. Some can take a light drizzle but many cannot withstand sustained rain or immersion (such as travel through deep puddles). The problem is the high voltages. It’s hard to weatherproof when you’re operating at 36-72 volts. The most water resistant are the $5000+ mountain bikes with sealed Bosch mid-drives and Bosch batteries. But the ebikes that you can get for under $2000 lack the weather sealing needed for truly rainy environments. Just read the reviews on ebike sites. The same goes for aftermarket kits - such as what would be needed to make an electric assist trike. Not the answer you're looking for? Browse other questions tagged safety commuting-bike or ask your own question. What is a good camera arrangement for city riding? What is the narrowest tire you would use for commuting? How to keep glasses dry in the rain?